Hiroshima dedicated itself to spreading a message of peace after the atomic bomb "little boy" was dropped on the city on August 6th, 1945. We give you a rare glimpse inside the Peace Memorial Museum which displays the horrors of nuclear war. On August 6th, 1945 at 8:15 the first atomic bomb used against mankind was dropped on Hiroshima. It killed tens of thousands, including many children, and devastated the lively area. The Hiroshima Peace Museum serves as an important reminder of the cruelty and devastation of nuclear war as well as the importance of peace and today, I have the honor to introduce it to you. The A-bomb Memorial Hall was established in the former Peace Memorial Hall and the City Auditorium, now known as International Conference Center Hiroshima, in 1949. It served as the first public display of items related to the atomic bomb attack and was the predecessor to the Peace Memorial Museum. The Peace Memorial Museum itself opened its doors in 1955. It was constructed alongside the Cenotaph for the Atomic Bomb Victims, the Peace Memorial Hall and the City Auditorium. The museum consists of the east building and the main building. The main building is currently undergoing renovations and will be reopened in 2019. Some of its most famous items are displayed in the east building. The east building is the only part of the Peace Memorial Museum open to the public until the re-opening of the main building. It has two entrances, one towards the street and one towards the Peace Memorial Park. The entrance towards the street houses the Peace Watch. Showing the current time, the number of days since the dropping of the atomic bomb as well as the days since the most recent nuclear test anywhere in the world. Please buy a ticket (200 yen for adults) at the first-floor ticket counter and take the escalator to the third floor. The first area of the third floor shows you the destruction caused by the atomic bomb through a picture wall as well as a video panorama showing Hiroshima on the morning the bomb dropped as well as after the mushroom cloud lifted. In the next area, you will find a big screen showing video testimonials of survivors with English subtitles. Feel free to rest here for a while listening to peoples real stories of this fateful day when Hiroshima changed forever. The last room provides you with information about the Manhatten Project which was responsible for planning and creating the bombs and dropping them on Hiroshima and Nagasaki. Here you can also find information about the nuclear warfare situation since Hiroshima as well as the efforts concerning the prevention of nuclear war. The small second-floor exhibition shows the rebuilding of Hiroshima as well as how people tried to return to everyday life in the years after the bomb through pictures and articles. It explains how the city became a city of peace and their efforts to prevent people from repeating such a horrific event. Picture of memento marbles donated by Yukimi Matsuda. Drawings in the background: "They wanted water." by Akiko Takakura and A-bomb drawing by a survivor. Some of the most famous pieces of the main building are currently displayed on the first-floor special exhibition space of the east building. Uniform of a junior high student. School uniform donated by Shigeharu Fukuoka, cap and belt donated by Kurakichi Tsuda and gaiters donated by Kiyo Ueda. This student uniform is in fact not one boy's uniform but actually a combination of uniforms from three different boys. These boys belonged to the 353 junior high school students who were in charge of cleaning up a building after demolition 900 meters from the hypocenter the morning the bomb dropped. None of the 353 children survived their injuries. Shin's tricycle donated by Nobuo Tetsutani. Another famous item is the tricycle known as Shin's Tricycle. A little three-year-old boy named Shinichi Tetsutani was exposed to the bomb in his garden while riding his beloved tricycle. His father layed him to rest in the garden together with his tricycle. In 1985, he was exhumed for a proper burial and his father donated the tricycle to the Peace Memorial Museum. Watch that stopped at 8:15 donated by Akito Kawagoe. This kind of watch represents the image that many people have of the Peace Memorial Museum. It stopped at exactly 8:15 when the bomb dropped. Sadako's paper cranes donated by Shigeo and Masahiro Sasaki. A whole corner is dedicated to the girl which inspired the Children's Peace Monument, Sadako Sasaki. She survived the bombing but fell ill with leukemia and passed away 10 years after the atomic bomb. Some people believe that folding 1000 paper cranes will grant you a wish, so Sadako started folding them with all kind of scraps she could find in the hospital. She ended up folding more than 1000 paper cranes but unfortunately, her wish did not come true and she passed away in 1955. The first floor also houses the gift shop behind the ticket counter. Here you can buy items such as notepads made from recycled paper cranes that have been donated to the Children's Peace Monument. They also have a variety of related books and DVDs available in Japanese as well as English. Belongings of a female student donated by Mitsuo Shoda. The Hiroshima Red Cross Hospital was the relief headquarter directly after the bombing. The exhibition mainly consists of pictures and explanations of procedures commonly used on the victims of the atomic bomb. You might realize that many of the doctors and nurses had burns and scars themselves while trying their best to save others. Left to right: National uniform for civilians donated by Hideo Goto, Gaiters donated by Yoshiko Shibata and letters donated by Teruaki Komiyama. The two pieces in the back are from the collection of the Hiroshima red cross and atomic bomb hospital. Many of the patient's clothes on display are still blood soiled, have parts ripped off by the blast or clean cuts in order to remove the textile fused with the skin from the heat. Giving you a clear image of the pain and suffering. Pocket watch and pillow donated by Masaki Hironaka. When I visited the Peace Memorial Museum, the other room located on the B1 floor displayed 124 items of the 638 items donated in 2016 and 2017 by the families of atomic bomb victims and survivors. The exhibitions in this room change, so they might display something different at the time you visit. Seal and notification of death donated by Yoshinori Kuniwake. Every item comes with a story and many of them have pictures attached of the people they belonged to. The personal items, often damaged by the blast and soiled in blood, alongside the stories and pictures made me feel surprisingly attached to these people. Some people survived the bomb itself but all of them fought with the after effects for the rest of their life. Diary donated by Noriko Uedo, Student corps tag and name tag donated by Shuichi Ishizaki and Handkerchief given by her sister donated by Taeko Matsuno. 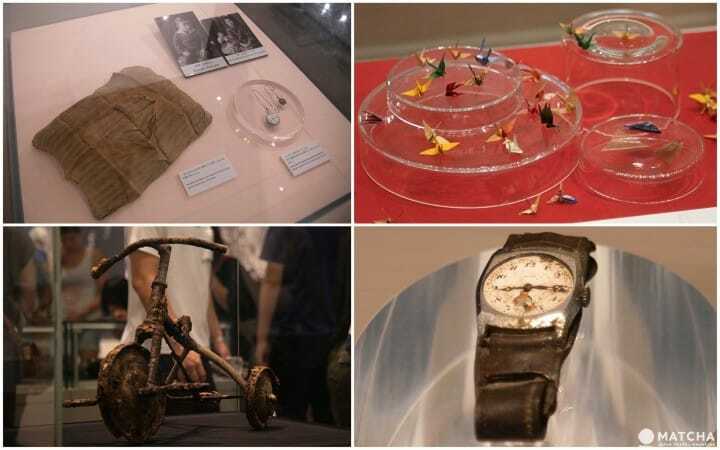 Many citizens of Hiroshima donated their ancestor's belongings to the museum in order to share their stories. Please be respectful and keep the following five points in mind. These glass cases are created to protect these precious items but if the thousands of visitors that come to Hiroshima every year lean on the cases, they will eventually get damaged and need to be replaced. You might accidentally lean on the glass case when reading one of the stories or observe an item a little closer. However, please try to avoid it if you can. Children might lean on the glass cases or even press their faces against them, as mentioned above, this will damage them in the long term. Also, the images displayed at the museum could potentially be very disturbing to young children. It is better to monitor what they are exposed to in the museum. Lastly, many people visit the museum and it is kept very dark, so you could easily lose your child in the crowd. All of the displayed belongings are over seventy years old and were exposed to an atomic bomb so many of them are in a deteriorating state. Photographing them with flash can cause further damage to the items, such as discoloration, so please avoid it by all means. The Peace Memorial Museum is usually very busy and the rooms are rather small. Please respect that everyone has their own pace reading and compensating what they are seeing. Try to avoid pushing people forward, even by accident and please keep your voice low when talking. Remember that this museum displays the fate of thousands of people dying and suffering after a horrible event and many of the victim's families still visit the museum. Wearing hot pants, low cut shirts or showing your stomach might not be the most respectful thing to do in this case. Make sure to be dressed in a respectful manner don't show off to much skin. The Peace Memorial Museum tries to tell you the stories of real people to help you imagine what it was like to be in Hiroshima or the surrounding areas on August 6th, 1945 when the bomb dropped. If you visit Hiroshima, it is highly recommended to include the museum in your plans. The city has made the horrific event its legacy and you can gain a better understanding of history Hiroshima is built on once you visit the museum. TeNQ Space Museum - Have Fun Exploring Space At Tokyo Dome City!